Pega Intelligent Virtual Assistant™ (IVA) for Email now supports the triggering of multiple actions during the intelligent routing of received emails. This improves the artificial intelligence capability of IVA for Email by making the system more automatic and responsive to user emails. 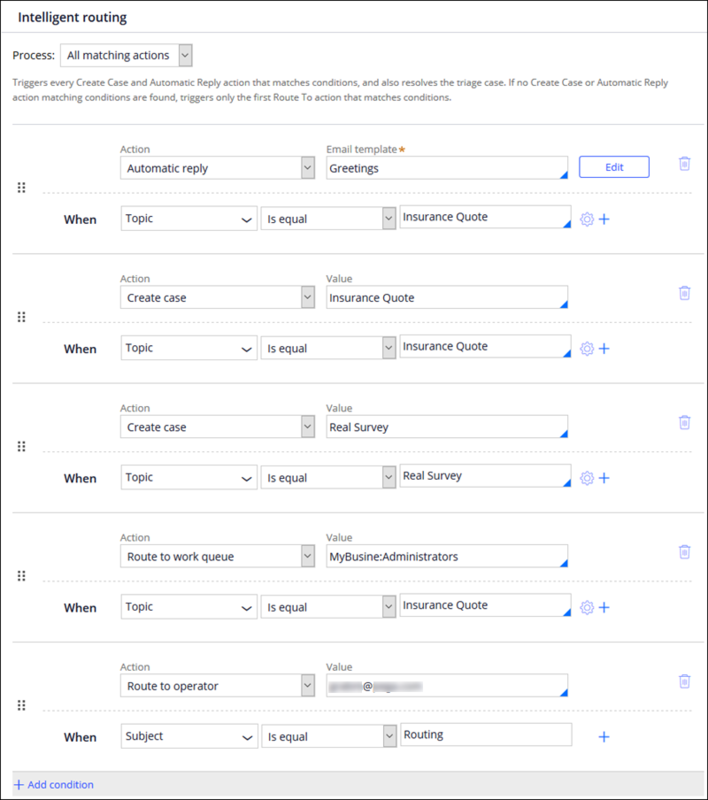 To use this feature, you must set up intelligent routing for an Email channel so that it processes all actions with matching conditions in the intelligent routing list. When you set up intelligent routing in this way, the system triggers every create case and automatic reply action in the list that matches the conditions, while route to actions are skipped. If no create case or automatic reply action matching conditions are found in the list, the system triggers only the first route to action that matches the conditions. For example, you can configure intelligent routing for an Email channel so that multiple actions, such as creating a case and automatically replying to an email, are triggered for the received email. In this example, if IVA for Email determines that a received email is a user request for a car insurance quote, the system can immediately create an Insurance Quote business case in Pega Platform™ and automatically reply to the email at the same time. For more information, see Intelligent email routing, Setting up intelligent routing in Intelligent Virtual Assistant for Email, and Configuring routing conditions for automatic email handling.